Friends, I am soooo thrilled to introduce you to Elizabeth Baddeley, illustrator of A Woman in the House (and Senate): How Women Came to the United States Congress, Broke Down Barriers, and Changed the Country. You have no idea. Not only is she an extremely talented artist that I’ve been wishing and hoping would work a children’s book one day, but I’ve also had the privilege of knowing her since I was a dopey high school kid. She is someone you’re going to want to keep your eye on. Blink and she’s everywhere. I work as freelance illustrator living in Kansas City, Missouri. I actually just moved back here to my hometown after living in New York City for a little over three years. I moved to NYC when I was accepted into SVA’s Illustration as Visual Essay masters program. Prior to that I worked in Kansas City as a designer for Hallmark Cards. When I’m not drawing or working on some creative project (which is almost always) I love to cook, spend time with my husband, Zack, and instagram WAY too many photos of my two cats. This summer I am going to be teaching my first class, which I am simultaneously excited about and terrified which is usually a good combination of emotions. Your first children’s book, A WOMAN IN THE HOUSE (AND SENATE), written by Ilene Cooper, is a nonfiction book for kids ages 8-14 about strong, revolutionary women and their positive impact on the US government. 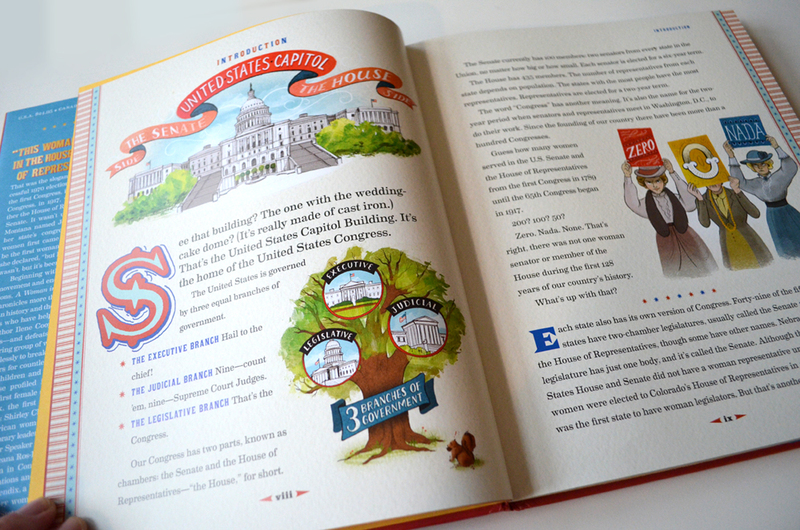 What was your favorite part about illustrating this book? I was surprised to find that my favorite part of illustrating this book was how much I learned. I had forgotten that one of the reasons I became interested in illustration in the first place was that you learn something new with each job you take on. 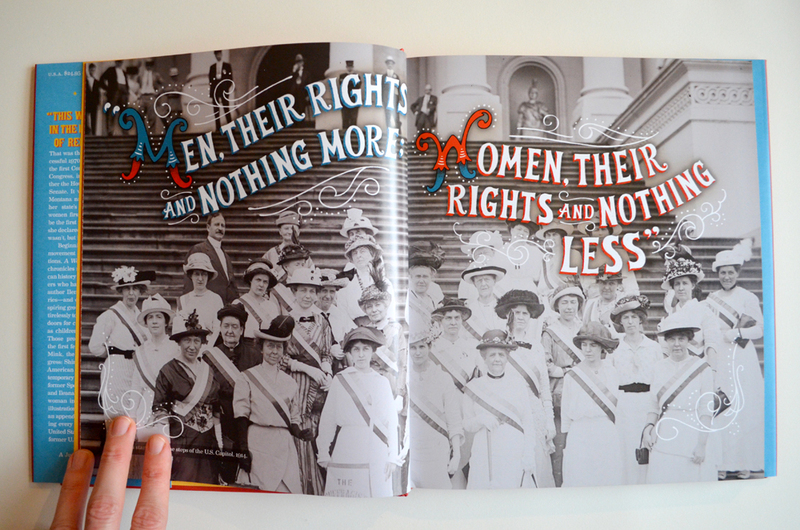 Not only did I learn about the women written in the book, but with each illustration came quite a bit of research. Whether I was looking up what the inside of the capitol looked like in 1920 or what women wore during World War II, each new drawing was a different history lesson. I also loved doing the lettering for the beginning of each section. The editor (Howard Reeves) had the idea of doing lettering in the style of each era. Normally I have a few fall back styles I like to use for hand lettering, but this really made me move outside of my comfort zone. Which woman or women featured in this book are you most inspired by? Any woman (or man quite frankly) that can take their career all the way to congress is an inspiration. However, I really loved learning more about Nancy Kassebaum Baker. She was a senator from Kansas from the late 70’s to late 90’s. 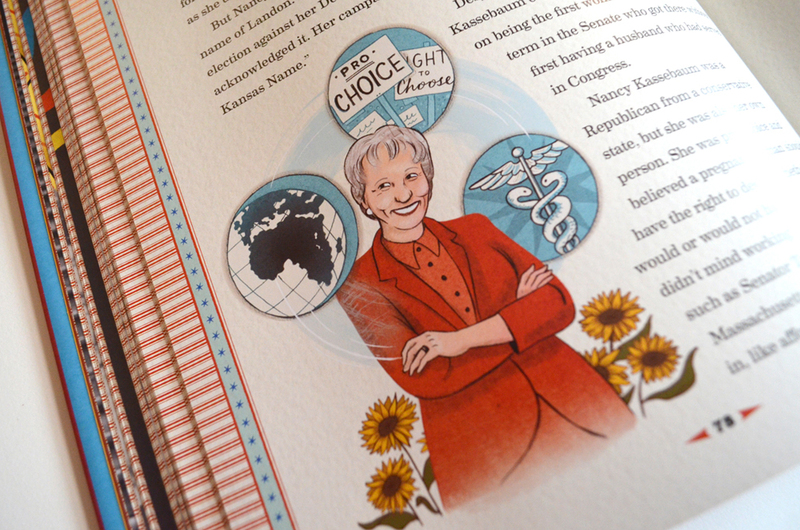 Being a child of the 80’s and a Kansan at that, I remember learning about Nancy Kassebaum from an early age. I didn’t realize at the time how lucky I was as a little girl to have a female role model like that right in my own state! She was only the second woman elected to senate that didn’t simply take over her husband’s seat! Another fact I didn’t know about her was that she was a moderate to liberal Republican that was highly involved in health care and ending apartheid in South Africa. Pretty important stuff there. 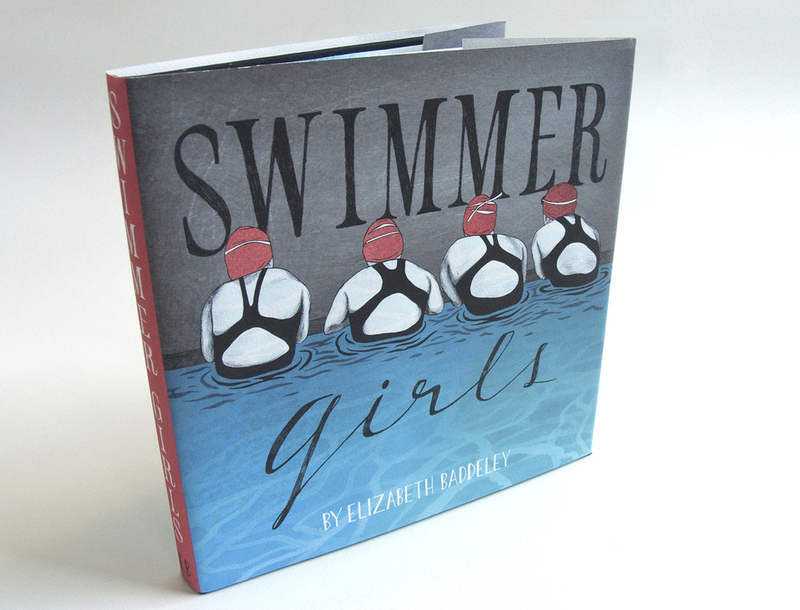 You won the Society of Illustrators Gold Medal for a stunning book you self published, Swimmer Girls. Can you tell us about the motivation and creative process behind that project? 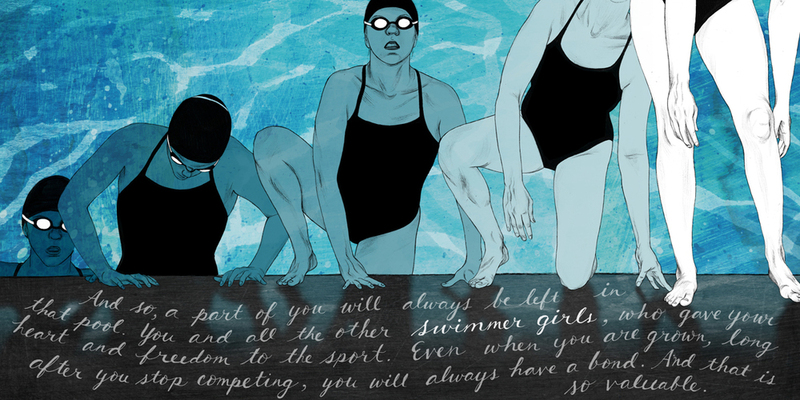 Well, first of all, I think it’s important to tell your readers that you ARE one of the Swimmer Girls. And not just in spirit. One of the originals! 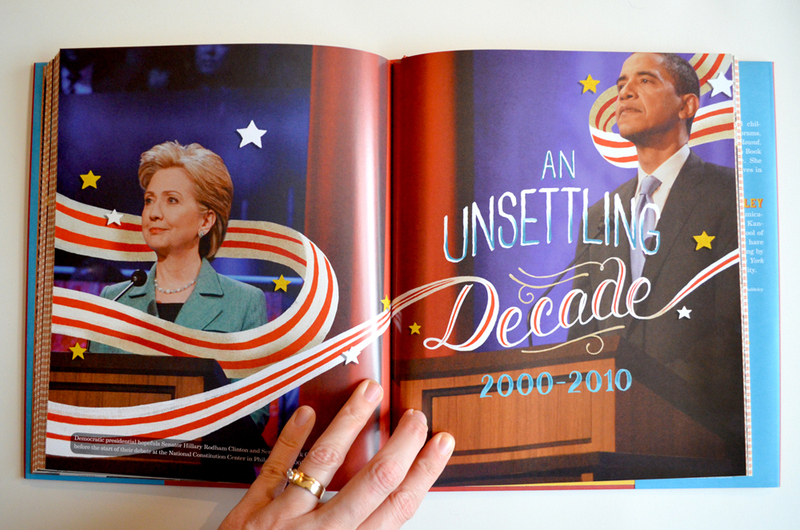 In our first year of the MFA illustration program at SVA we are given the assignment to make a book. That’s it. No other parameters. For some students, it’s very easy. They’re into childrens’ books so they do that. Or they like comics, so they make a comic. For me it was not so simple. I was still trying to figure out what kind of an illustrator I wanted to be. On the first day of class we went around the room and told everyone what our book was about. I was still pretty unsure so I just said “Swimming. 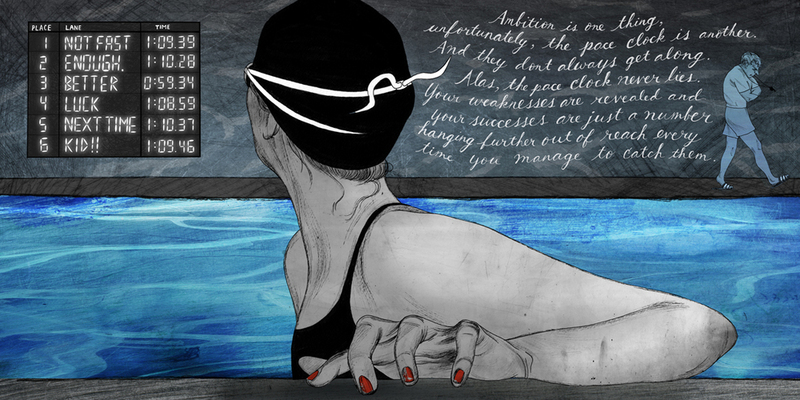 I’m going to go swim, and then I’m going to make art about it.” So that’s what I did. 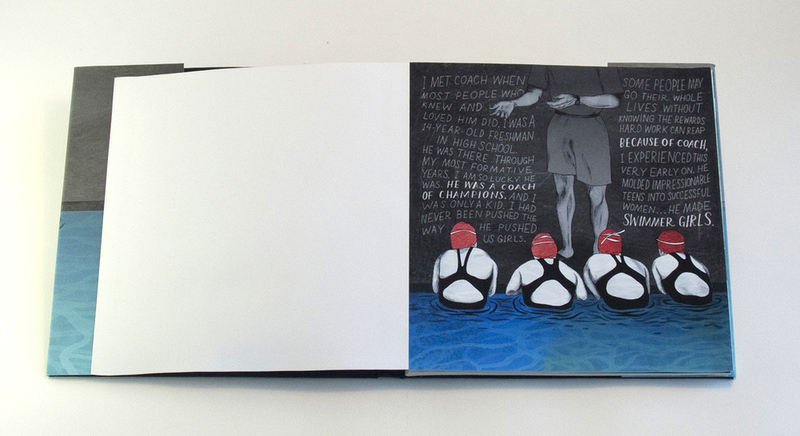 I would swim laps at the Chelsea rec center in NYC and then go back to my studio and work in my sketchbook. 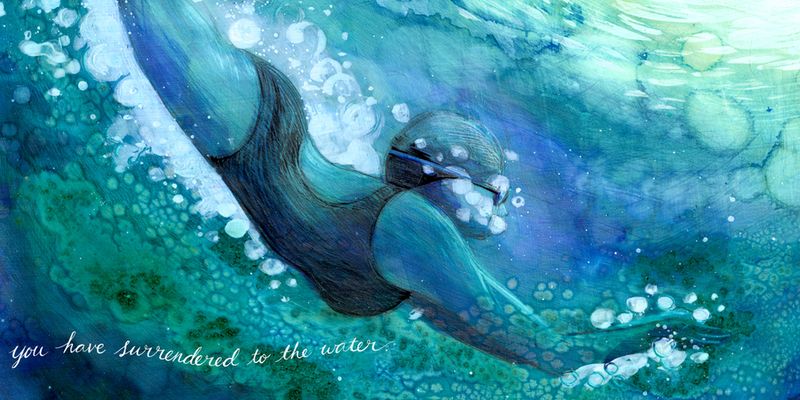 The wonderful thing about swimming is that while you’re doing it, you can’t do anything else. You can’t listen to music (well, I guess they make headphones for that now, but I’ve never found them to work very well), you can’t watch TV and you can’t talk. You’re pretty much alone with your thoughts. And trust me, a lot of thoughts come up. So I would write down whatever it is I’d be thinking about while I was swimming and then create imagery to go with it. Some days I wouldn’t even write. I’d just make water textures and brush strokes. I began to accumulate a ton of work. 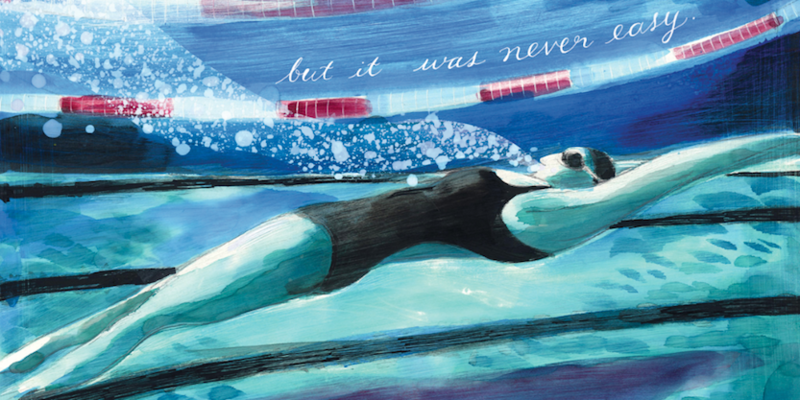 The pieces didn’t necessarily fit together in any sort of a story, but I began to notice that about 80% of my thoughts had to do with memories I had from being on the swim team in high school. I began to think about how swimming and being part of that team shaped me into the person I am today. So that’s the really wonderful part of the story. 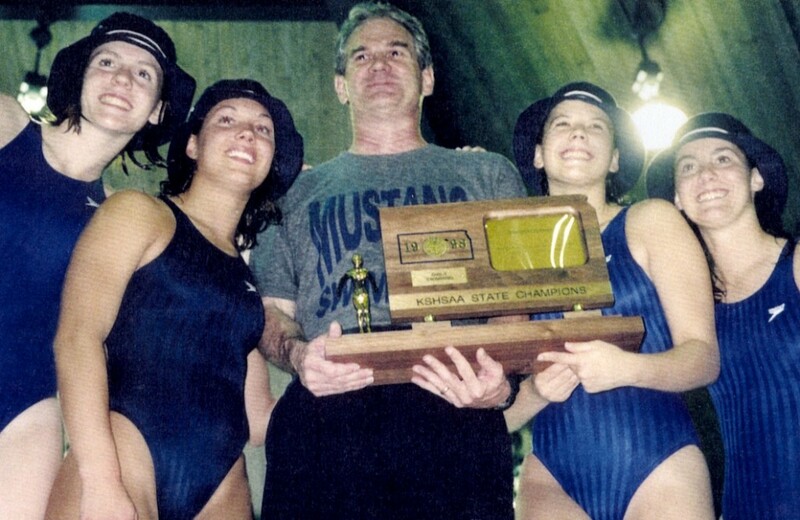 The really sad part is that when I was only a week or two away from finishing the work, my dear high school swim coach, Greg House, passed away. I had all these great images, but I still didn’t have any text and wasn’t sure if I would even add any. The passing of Coach changed all that. All of a sudden, the words just flowed. It became a dedication to him, that time in my life, and all the other women I shared the experience with. 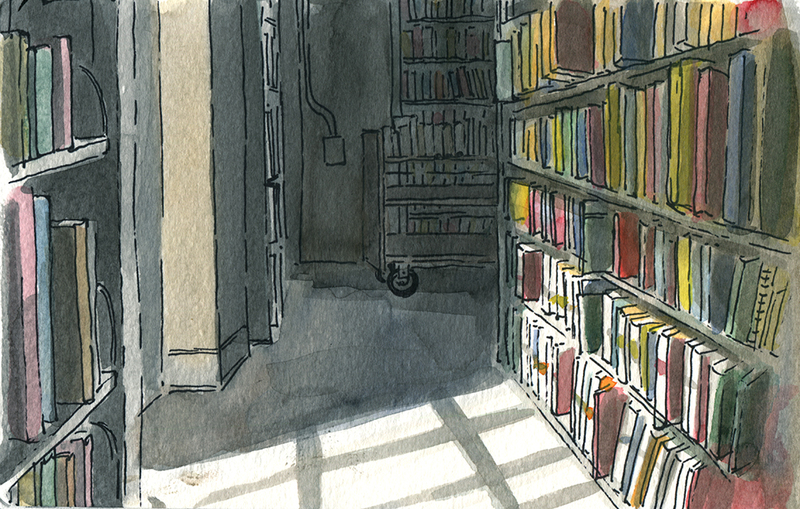 You’ve been getting a lot of love on Tumblr lately with your sketches of libraries. What role and influence have libraries had in your life? Well, that’s just been crazy. It all started when one of my images popped up on the “tumblr radar” which is a little link in the sidebar that shows relevant, popular content and changes daily. After that, everything I’ve made with a book or library in it has just blown up. People really have a connection with books, what they look like, how they’re displayed, not to even mention the stories they tell! 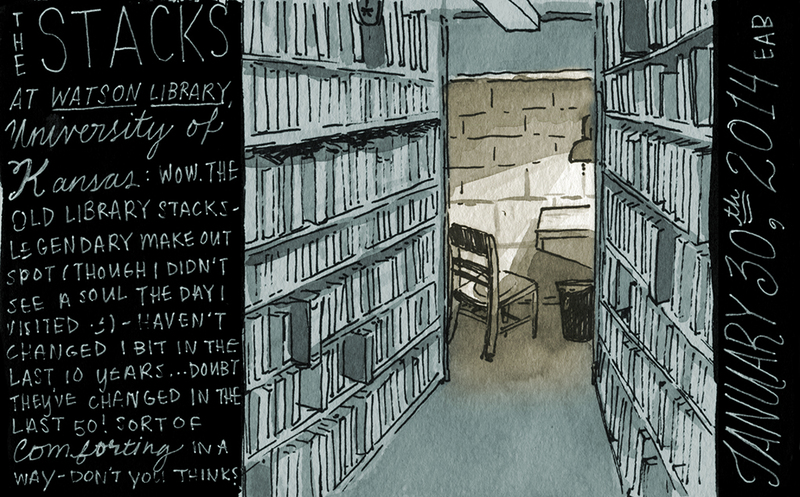 But to answer your question, libraries have always been a part of my life. There was never a time as I child that I don’t remember going to the library. My mom (who is actually now a librarian herself) was instrumental in my relationship with libraries as a child. I remember going on a weekly basis, filling up my book bag and going home with a batch of new stories. And that smell. Is there anything that smells better than an old library book (ok, maybe a fresh box of crayons)? I think I’ve always kept that childlike fascination with libraries. 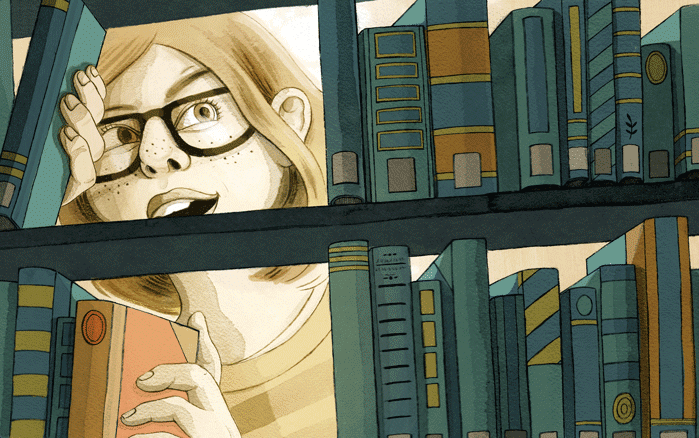 In high school and college, I much preferred to study at home, so libraries have always had a sort of a kid in a candy store sort of appeal to me. I prefer to browse the shelves being open to whatever will appeal to me at that particular moment. I allow myself to be surprised. And I never make a trip to my local library without visiting the kids section. Comfy chairs, big windows and a couple of cats! Where do you do the majority of your work? What do you listen to? When I’m not with my sketchbook drawing on location (which is actually where most my ideas begin), I am in my home studio, the second bedroom of our apartment in midtown Kansas City. What I listen to entirely depends on what task I’m doing. When I really have my thinking cap on, sketching ideas or writing I don’t usually listen to much. Either classical music, or like today, the wind blowing and cars driving by outside my window. When I’m doing something that requires less concentration I love audiobooks. For some reason I get distracted with music, but with an audiobook (or podcast), I can focus for hours! My favorite ones lately have been The Goldfinch and the Steve Jobs biography. When it comes to podcasts I’m a long time This American Life listener, love The Moth and have been recently turned onto Snap Judgement. It’s great. One of my favorite questions to ask children’s book authors and illustrators is what books did they read over and over and over again as a child? 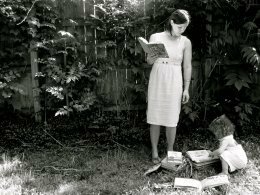 What were your must-reads? Oh man, this is a long list and I know I’m going to forget something super important. My parents read to my brother and me every single night. It was a huge part of my childhood. The first book I could ever “read” to myself was Madeline. I really just had it memorized. I made my parents read it to me so often. 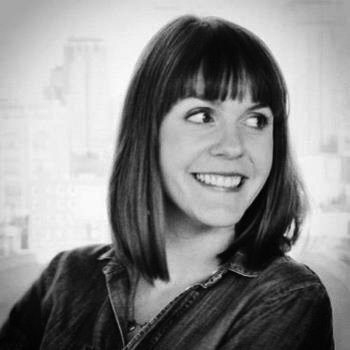 As a young child I loved anything Beatrix Potter (The Tale of Two Bad Mice being my preference), Steven Kellogg, Shel Silverstein, Jumanji, Cloudy With a Chance of Meatballs, and of course, Alexander and the Terrible Horrible No Good Very Bad Day. I was always drawn to books with really detailed illustrations. Maybe because we read the same ones over and over and it gave me something new to discover each time. When I read Little House book series, Pippi Longstocking, anything Roald Dahl wrote, and I think my favorite at the time and will possibly forever be, Harriet the Spy. What books are sitting on your nightstand this very moment? What are you currently reading or hoping to read soon? I’m reading Goodbye to All That which is a collection of short stories about people who’ve left New York City and the mixed feelings associated with that and also The Casual Vacancy by J.K. Rowling. Not sure what is next. Have any recommendations? I might just read Harriet The Spy again. What’s next and new with you? Are there more children’s books in your future? I sure hope so! I’ve actually only recently discovered that YES! I want to make children’s books! I’m working on a project with Storybird, as well as doing some illustrations for grown ups. This summer I will be teaching a class at the Kansas City Art Institute. And most importantly, I’m working on building a portfolio and some book dummies for the SCBWI summer conference in August. Even after working on my first book, I’m not entirely sure what I’m getting into. I hear the conference is a great experience and I hope to learn a lot more there. Where can we keep up on all things Elizabeth Baddeley?